"A unique recording taken from a live broadcast performance May 16, 1955 at the Royal Theatre in Bath, UK. 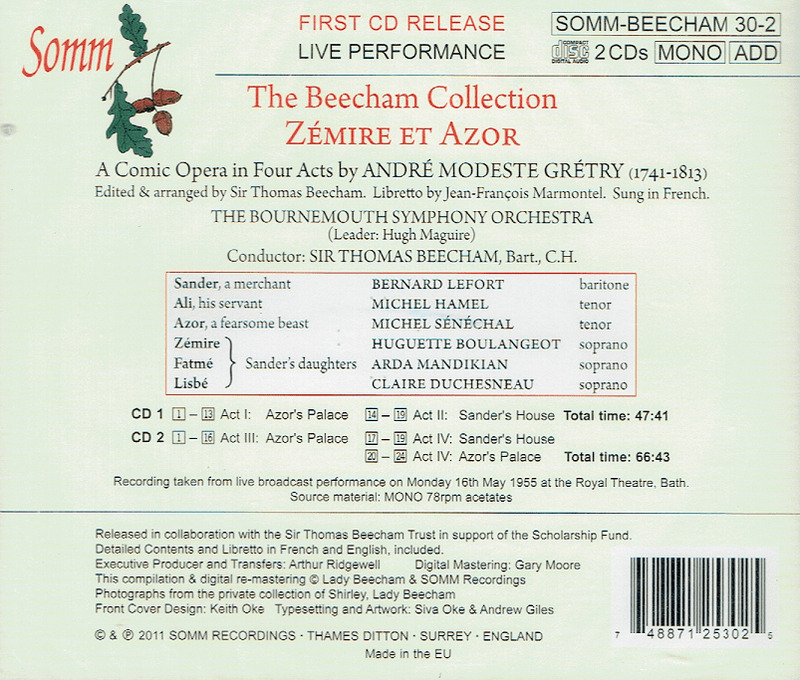 SOMM's efforts in highlighting Sir Thomas Beecham's conducting genius in exclusive live performances came to the fore during 2011, the year of the conductor's 50th anniversary (April 1879 - March 1961). Now, SOMM presents a very special, long-awaited premiere release. 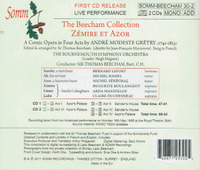 Beecham's love of French music was well known through his regular performances of 19th-century works by Berlioz, Bizet, Chabrier, Debussy, Gounod, and Franck, and his library was full of valuable first edition scores of operas by Grétry and Mehul. 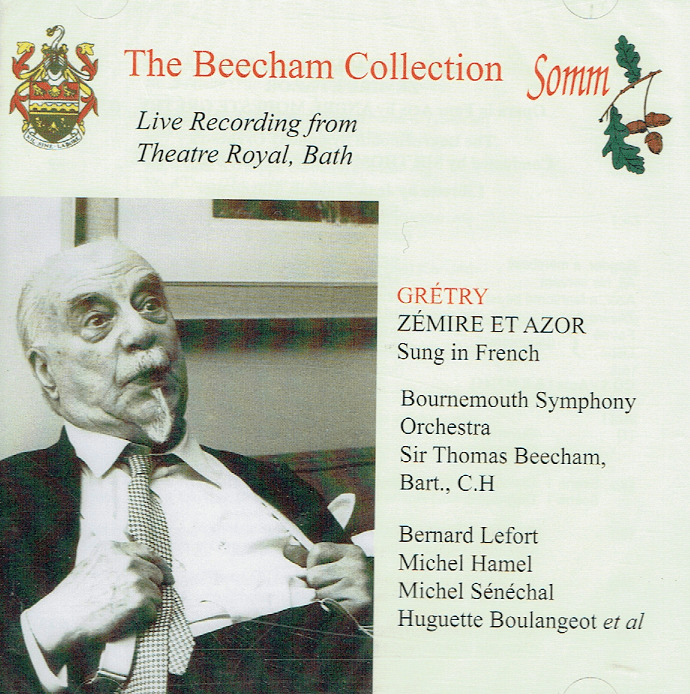 The sparkling performances and production of ZÉMIRE ET AZOR, sung in French by a hand-picked French cast at the Royal Theatre, were considered to be the highlight of the May Festival in Bath." Having been shipwrecked in a storm, the merchant Sander and his servant Ali find their way to a strange palace. A banquet has been laid, though there is no sign of the owner, and the two help themselves to the feast. When Sander plucks a rose from the palace garden to give to his daughter Zémire, the beast-like Azor appears. He is the owner of the palace and says Sander must pay with his life for stealing the rose, unless he can persuade one of his daughters to take his place. When she hears what has happened, Zémire agrees to sacrifice her life for her father and Ali leads her to the palace, where she almost faints at the fearsome sight of Azor. However, Azor proves to be a kind host, showing Zémire her family in a magic mirror and even allowing her to visit home again so long as she promises to return. After a stay with her family, Zémire decides to return to Azor and finds him in despair because he believes she has abandoned him. She protests that she cares about him and the magic spell on Azor is lifted now he has found love. He changes from a beast to a handsome prince and claims his kingdom with Zémire at his side.